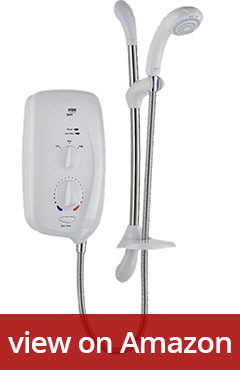 Electric shower – awesome when works, tiresome when doesn’t. Have you ever had an electric shower which didn’t hold temperature well, the temperature was unstable, there were problems with the water flow. Oh yeah, I’ve been through all of it. That’s why I decided to make this buying guide – don’t ever make the same mistakes as me! While searching for the best electric shower might seem hard, we are in 2018 and the quality got much better! Digital and precise thermostats, beautiful design, and they still doesn’t cost that much! This is my TOP pick. Excellent product by well-known TRITON company. Awesome price together with great reliability and capability. The models range from 7.5kw up to 10.5kw to suit anyone’s needs. For maximum flexibility, this shower offers 5 water and electric cable entry points, so it will be much easier to match it to existing wiring and plumbing. High power is basically full power. Use when necessary. Economy might be better suited for summer use when the water is not that cold. And cold setting is basically cold water. 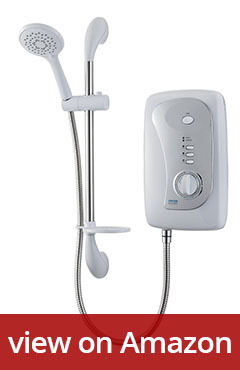 The shower head is limescale resistant and has 5 different spray effects. Shower head features 5 different spray effects for the best showering experience. 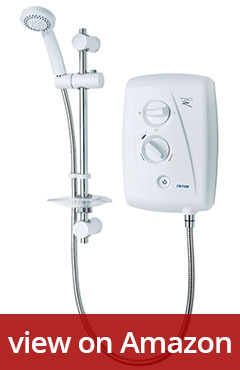 Triton is a very well known and established company bringing electric showers for more than 30 years. High-quality product by Triton with a power of 9.5kW featuring flexible electric and water connections to be easily fit in any place. This one is designed to cover all footprints by the previous installation, so no areas without tiles will be visible and no additional work needed. Shower head features 5 different spray type options. This shower is truly meant to be an easy install. With features like Swivel fit – which is a fully reversible water inlet for left and right connections, or a Swing Fit, which is the same but for cables. Electric shower by Mira Showers company. While not the best one in my top list, still an excellent appliance for your bathroom. 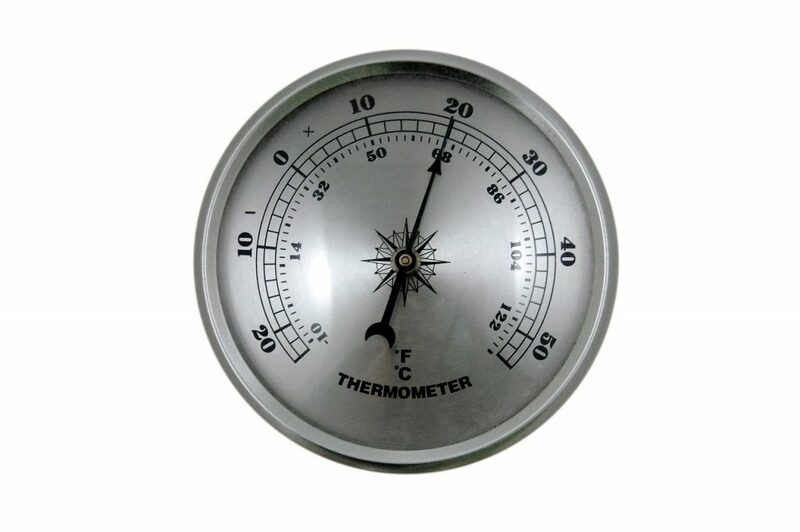 It has an analog dial for manual temperature control as well as ECO setting for saving energy. Multiple entry points for both water and electricity will make your life much easier during installation. Triton Martinique is another great Triton shower. 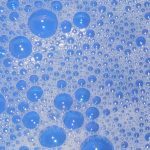 If you are worried about limescale build-up, you don’t need to. This one has so called “phased shutdown”, or limescale resistant shutdown, which should minimize a build-up of limescale. The plastic shower head is equipped with five different spray patterns. Three settings, cold, ECO and HIGH are controlled via practical push buttons. When looking for the best one, we expect it to be reliable, safe and energy-saving. It has to heat the water up on its way to the shower head from your water supply. The perfect thing about this is that it only heats up the water you actually need! This means it’s pretty efficient. Heating the water on the go means the heater has to work with big electrical current and has to be really powerful (More than 7,5 kW usually). Energy-saving doesn’t mean it should be under-powered. It means it has to be efficient. If the heating system hasn’t got enough power, it won’t be able to heat it up the fast flowing water. And who would like to shower under a very slow stream of water? High power is important for electric showers to work properly and being able to heat water to a pleasant temperature at a comfortable flow rate. Showers with their own flow heater are independent of all your heating systems, so even if they fail, you can still have a warm shower! Before we get into the advantages of owning one, you may be wondering exactly what one is, and how it differs from a normal shower. Normally, you would deal with a pump-assisted power shower, that uses your normal hot water tank to ensure that you’re going to receive hot water. In domestic situations, there’s typically a boiler involved. For an electric shower, you’re going to see a bit more efficiency. Because of the lower flow rate, the only water that is heated is the amount of water that you’ll be using during your shower. Let’s take a look at the opposite type of shower: the mixer shower. 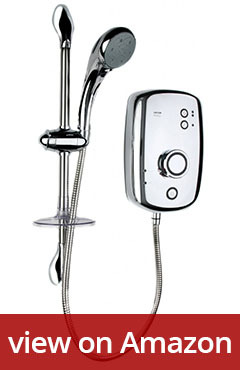 A mixer shower utilizes water that’s already in a tank and heated up. While this may seem like an advantage, once the hot water is gone, you’re going to have to wait for the tank to fill up entirely again. However, an electric shower combats this one problem in a huge way: it only heats the water that’s necessary for the shower, rather than the entire tank; and it does so by using electricity! By utilizing this method, not only you never run out of hot water, you can also save a nice amount of money through energy efficiency. Keep in mind that you have to have a powerful electricity installation in your house. Such a shower can eat up to 11 kW of energy at peak. Not only will you receive hot water on demand, but you don’t have to wait for the tank to fill up again. In having these benefits, you’re going to be able to save water, and get the heated water when you need it. You won’t have to wait until the shower runs cool or hot ever again, as the heating element allows the water to heat as it comes to you. Having this ensures that you don’t have to wait for the entire tank to become the same temperature, and you won’t have to waste money on utility bills every month. An efficient method of heating water, it’s worth mentioning that you’re also going to be entirely safe. 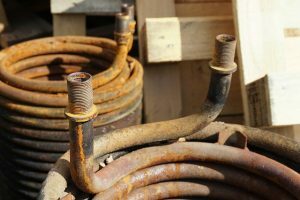 Those who think electricity and water shouldn’t mix are correct; however, the heating element doesn’t actually touch the water – and never will. There’s a sealed area where the heating element sits, allowing the water to pass through and pick up the desired heat as needed. If you need to run out in the morning to work or school, you won’t have to worry about being late, as the water won’t take long to heat. Not only will you save time because the water heats up quickly, but you’ll also conserve water because you won’t be waiting for it to heat up. Those who are familiar with running out of hot water because someone else used it or is using it at the same time will find solace in learning that electric showers won’t experience this. Because of the heating method, and the lack of heated water in a tank needed, everyone using the water at the same time will see efficiency in how their water becomes heated and remains hot. “But what if my boiler breaks?” You may ask. Good news! When your boiler breaks, you won’t have to worry about your water not being able to be heated, as the heating element can still have the water run through and become heated. Because of its independence in the heating and water system, it’s much more versatile than heating methods that are more traditional. What’s better than saving money, conserving water and energy, while being able to use it even when other parts are broken? An electric shower is a safer and smarter choice while allowing your life to be more flexible and enjoyable. Mornings don’t have to be such a drag anymore – get that piping hot shower and relax before you head out for a hectic day of work. What’s the difference between an eco-friendly shower and an electric shower? 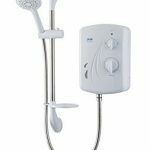 You may be wondering what the difference between an eco-friendly shower and an electric shower is, especially since an e-shower is supposed to be energy efficient. You’re not wrong, and electric ones are generally more efficient; however, eco-friendly showers are typically known for trying to lower the water usage during your shower the most. The way that an eco-friendly shower does this is via a low-flow pumping method. You may also be wondering if this method sees a lower water pressure while showering, and the answer is no, but it’s worth mentioning that you can save up to 70% on your water bills, depending on your country. While these won’t be super cost efficient up front, the long-term payoff is fantastic. For those that want something efficient enough on their bills and with a normal installation cost, the electric shower may be the middle ground for you. Is this shower best for my family and me? Now, there are a ton of different types of showers (I didn’t cover them all here), but you may be interested in learning what type is best for you, and if the electric shower is on that list. Households that have a very limited supply of water may see more efficiency and better usage through an electric shower due to the heating element’s ability to heat as the water comes through. Because of the similar operation to a kettle, and the abundance of people that may be in your household, the quick heating mechanism of an electric shower reigns supreme on households with a larger number and a limited supply. The only way to ensure consistency in the water temperature is to invest in one that delivers heat when it’s needed, on-demand, and that’s with an electric shower with thermostat. Because the water passes through the heating element, you won’t have to worry about someone stealing up all of the hot water because they jumped into the other bathroom first. In fact, when both bathrooms have an electric shower installed, you can both receive hot water on demand and you won’t have to worry about getting in the shower first. Before we get into anything else, let’s take a look at some factors you should consider before investing in one, as well as tips to know before purchasing. There are homes that suffer from water pressure that’s much lower than other places, and while sometimes this has to do with your area, sometimes it has to do with your hardware. Those that see a lowering in pressure during showers may find a suitable resolution when purchasing an electric shower. The aforementioned is due to the ability for it to pull off of the main supply of water, but adequately enough to combat the low-pressure issue. If you live in an apartment, condo, or home that suffers from this issue, you should invest in an electric shower to not only conserve water, energy, and money but so you can finally have an enjoyable shower once again. Flow rates and pressure of water: Before jumping in, you’ll want to make sure that your home has an adequate reading for water pressure and for the type of shower you’re going to invest in. 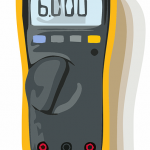 In knowing this, you’ll be able to find out the perfect kilowatt rating for your home. While there is no minimum or maximum water pressure reading, you’ll have to find the one that matches up with the kW rating perfectly to ensure the best water pressure possible. Circuit breaker or fuse rating: In knowing your circuit breaker or fuse rating, you’re able to see if your device can handle the power you’re going to be supplying. When seeing if this device will work for your home, you can ensure safety and that you won’t be spending hundreds (or thousands) only for it not to work. Power is key with an electric device, and the aforementioned is no different. 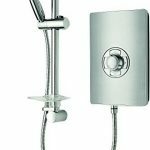 Electric cable size for shower running: Last, but surely not least, you’ll want to make sure that the electric cable you’ll be using for a system connection is suitable for your electrical within your home. Without, you run the risk of a safety hazard or a waste of money. 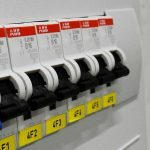 As we’ve mentioned quite a few times, you’ll want to know the proper electrical amperage before buying a specific kilowatt rating. You can find the guide below to give you an idea. Depending on where you live, you may or may not have to translate the measurements. The wiring of the showers like these depends entirely on the above-mentioned rating system. The shower ratings above will work with the corresponding amperage within your home. Not following the proper power output can result in not enough power or too much – risking your safety or wasting your money. Because of the power and electric mixed in with water, you’ll need a specifically certified professional for installation of an electric shower. As a kid, you see the shower as a form of punishment or a chore. But as you get older, there’s this joke saying that the place where you make important life decisions is in the shower. Taking showers is done more than for the hygienic aspect. It also helps the body to relax and relieve stress and relax your muscles. Other than the toilet, the shower is one of the most crucial places in one’s bathroom. Although showers are essential for all households, would you know that there are different types of showers? 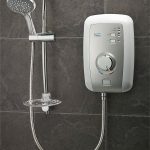 There is a variety of shower types to choose from, but the most ideal, suitable for every lifestyle is an electric shower. The difference of this kind of shower from the others is that it heats the cold water without using a boiler – it uses a built-in flow heater instead. It’s kind of like how a kettle works where the water will pass through a heating element once the shower is turned on. The water will be heated electrically by a device located in shower box. It does not use up any stored hot water since it automatically heats the water passing through it. Electric showers can be connected directly to the water supply instead of the hot water storage. The water passing through it is heated immediately before spraying it out of the spout. 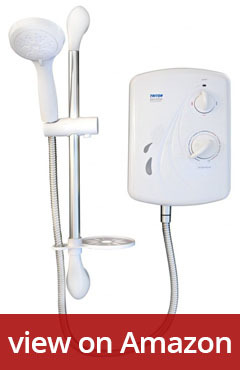 The electric shower is ideal for households that have limited supplies of hot water. Instead of waiting for the supply to be replenished or postponing your well-deserved bath, this kind of shower can grant you the warm, relaxing waterfall you crave for. E-showers are ready for use 24/7. The main advantage of this type of shower is that it never runs out of hot water simply because the water from any supply, be it cold or hot, is automatically heated in the shower itself. By the time it reaches your head, it is warm enough for that refreshing bath you have been craving for. Electric showers have modes that control the temperature of the water. With this, you have enough control on the intensity of the heat. The water pressure is not a problem as well since showers that are electric have built-in pumps that support water pressure. It’s also amazing since it can still heat water without the use of a boiler. You can have hot water any time of the day, and any day of the year. In the United States, electric showers are not very common. These showers are more known in colder countries such as the United Kingdom. Third world nations make use of them as well because of its practicality. These are best used in places with low water supply. In addition, electric showers are additional sources of heat for people living in cold climates. They are super easy to use. They can cut a significant amount from your electric bills. It is also good to have one in case the water supply has an unexpected shortage. Although it is not very common in most places, it has several advantages that make it worth having. A very common problem of many households. Some electric showers refuse to work under very low pressures and even if they work, showering with such a low pressure is very uncomfortable. What can be done to avoid such problems? Dealing with pressure in your water pipes is not an easy task and might be very costly, many times unsolvable. But what you can change, is a way you treat that low pressure water! Buy a shower with a pump, which increases the water flow through the heater. No matter how low your pressure is, showering will be much more pleasant with the use of pump which increases it. Here are the best pumped electric showers. 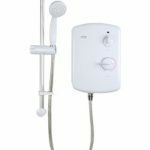 An electric shower has to be connected to a cold water supply and electricity. The cold water supply is usually a 15 mm pipe. Electric supply needs to by able to deliver up to 10.5 kW of power so it needs a separate fused electric circuit, this will usually need an electrician to set it up. When upgrading your shower from an older, lower kW model, there’s a possibility that all the electrical wiring will have to be changed for a thicker wiring capable of withstanding higher electrical currents. Let professionals do the job. Electrical wiring has to be made absolutely flawlessly to avoid short-circuit and then possible fire.